Summer fashion suffers here on the surface of the sun. Too dressed? Bake from the inside out. Too bare? Look like you believe you possess thighs from younger years. 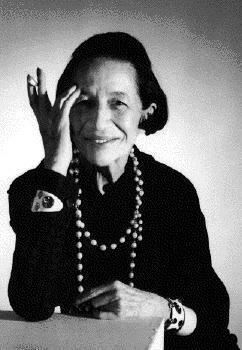 All we can do is stay inside, wish for fall and take a page from Diana Vreeland. The Divine One, oh you don’t know her? Vreeland was a lifestyle “IT” girl before it was trendy to be so. A fashion journalist first then fashion editor at Harper’s Bazaar from ’36-’62, then editor-in-chief of Vogue from ’63-’71. She also brought the Costume Institute at the Met to life after being unceremoniously dumped by Vogue. Seems she spent too much money. Perhaps they regret that now with Anna at the helm. Given her salary and the size of the September issue, Vreeland’s lavishness might seem positively paltry. What caused today’s rant? Temps spiked above 100 last week which sent me to Netflix documentaries. Oh, who am I kidding? Anything can send me to Netflix documentaries–a chipped nail, a mere moment of boredom or the need for chilled Pinot Grigio. Pfft. Dissection of Vreeland’s escapades in fashion comes in the 2012 doc, The Eye Has To Travel, the story of her storied life. She also said some other totally Doll-Worthy stuff. “You gotta have style. It helps you get down the stairs. It helps you get up in the morning. It’s a way of life. Without it, you’re nobody. I’m not talking about lots of clothes.” Preach sister. Prohibition. Insane idea. Try to keep me from taking a swallow of this tea and I’ll drink the whole pot.” Don’tcha just know this is a martini girl? “Oh, but I think that thoughtfulness and manners are everything.” Gloved hand waving. “To be contented—that’s for the cows.” Can this girl be my mom? “Fashion must be the most intoxicating release from the banality of the world.” She stole that from me. And then there’s her famous, “Why Don’t You?” column that ran in Harper’s–filled with gems for living the well-heeled life. – Paint a map of the world on all four walls of your boys’ nursery so they won’t grow up with a provincial point of view? Embrace your persona–the one deep inside you keep hidden? We all want to meet that girl.